SpyStudio lets you compare two traces to find the differences between them. For example, we use this feature to create virtual profiles for applications. 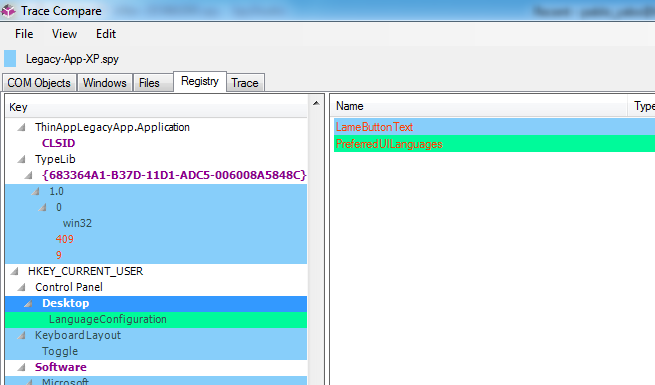 Sometimes there is a problem with a COM object, a missing dll, a window that cannot be created or a missing registry key. 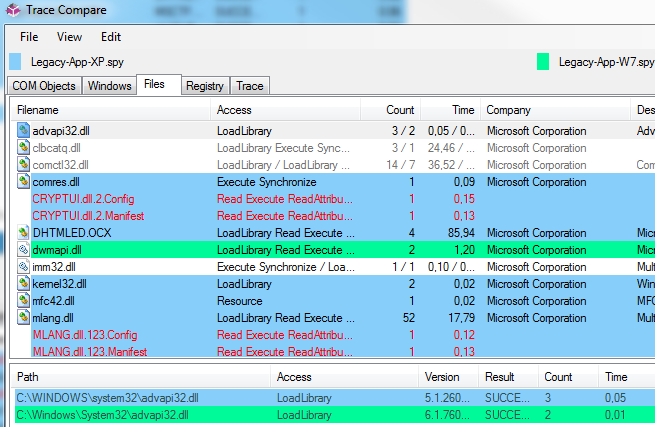 These errors are easy to spot by comparing traces in SpyStudio. The differences in the traces are recognized and interpreted by SpyStudio to highlight the most probable causes of errors. You could also use this feature when you have an application that is running well on a system but you cannot make it work on another. 1. Capture two traces and save them. The first thing you need is two traces to compare. Normally, you will get a trace of a process in an environment where it performs well and another in an environment where it doesn't. If you don't know how to get a process trace, take a look at this article: Trace an application from startup. Take into account that the comparison will be much more accurate if you trace the executions from startup. 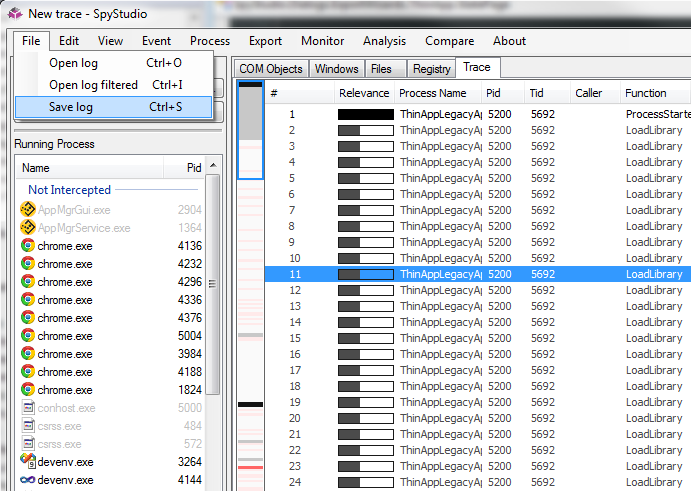 To save the traces, just go to "File"->"Save log" as seen below. 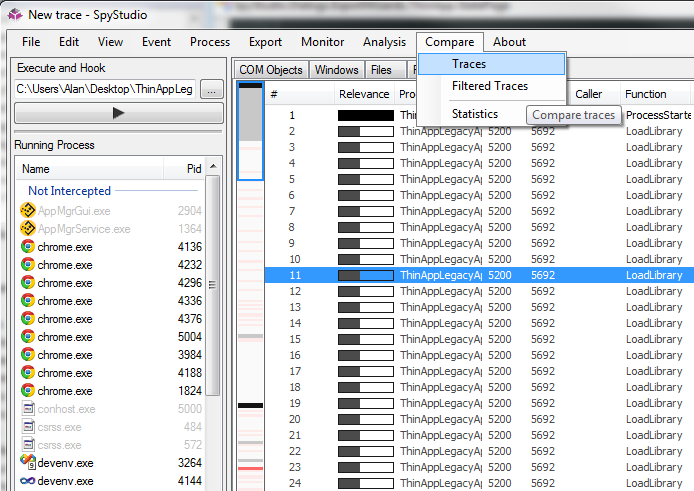 Go to "Compare" -> "Traces" and wait for SpyStudio to process both traces and display the comparison window. This example shows a comparison between the traces of a custom application (ThinAppLegacyApp) running on Windows 7 x64 and the same application running on Windows XP. In Windows 7, the application crashes during start-up. 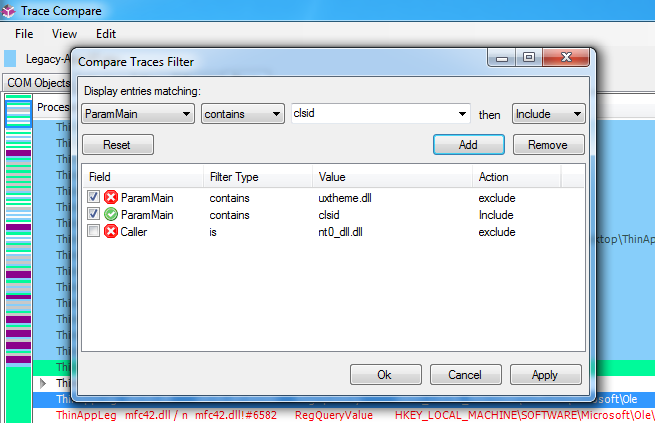 Calls: each field in trace control represents a specific call which can be in one of the files or in both. Calls: each field represents a group of calls that have the same parameters. Time: time that took the calls in milliseconds. This tab shows the list of COM objects instantiated by both processes. Here we can see that a COM object which was successfully instantiated in Windows XP, couldn't be instantiated in Windows 7. Hence, the process stopped prematurely under Windows 7 and didn't got to instantiate all the COM objects that were instantiated under Windows XP. This tab shows the windows created by both processes. Again, we can see the differences between both traces. The process wasn't able to load completely on Windows 7, so it didn't got to open all the windows that were created under XP. It shows files opened in both traces. Here you can see that most file accesses are unmatched, since the different versions of windows have different versions of system files. This tab shows the registry entries accessed by the processes. Here we can see differences in the registry usage too.